Charlie Gilmour, the son of Pink Floyd guitarist David, has been released on bail after his arrest over last week's tuition fees protest. He was arrested at his Sussex home on Sunday on suspicion of violent disorder and attempted criminal damage of the Union flag on the Cenotaph. The 21-year-old student was taken to a Sussex police station where he was also arrested on suspicion of theft. He was bailed until a date in June pending further inquiries, police said. Violence flared in London on Thursday when thousands of students protested over the decision by MPs to treble university fees in England to a maximum of £9,000 a year. 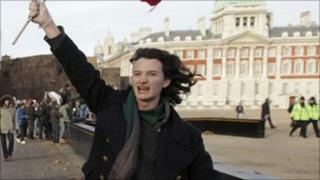 Photos of Mr Gilmour swinging from a flag appeared on the front pages of many newspapers after the demonstrations. Mr Gilmour, a Cambridge University student, has already apologised for his actions at the Cenotaph, saying he was "mortified" by his "moment of idiocy". He said in a statement: "I would like to express my deepest apologies for the terrible insult to the thousands of people who died bravely for our country that my actions represented." A total of 36 people have been arrested in connection with what was the fourth national protest over the issue. Police said 34 students were initially arrested, all of whom were bailed, followed by a further two over the weekend. One of those was Mr Gilmour, and the other is a 17-year-old male who handed himself in at a central London police station, where he was arrested on suspicion of violent disorder. He is still being held. Earlier, the Independent Police Complaints Commission said it had received 40 complaints about the policing of the protest in London. In total, 85 complaints have been registered by the IPCC since the first demonstrations a month ago.